Options give the owner the right, but not the obligation, to buy or sell an underlying asset or instrument. An option that conveys the right to buy something at a specific price is called a call; an option that conveys the right to sell something at a specific price is called a put. Today, many options are created in a standardized form and traded through clearinghouses on regulated options exchanges, while other over-the-counter options are written as bilateral, customized contracts between a single buyer and seller. The most common options are European, which may only be exercised on expiration, and American, may be exercised on any trading day on or before expiration. Nearly all stock and equity options are American options, while indexes are generally represented by European options. out of the money: A call option with a strike price that is higher than the market price of the underlying asset, or a put option with a strike price that is lower than the market price of the underlying asset. stochastic: Random, randomly determined, relating to stochastics. in the money: For a call option, when the option’s strike price is below the market price of the underlying asset. For a put option, when the strike price is above the market price of the underlying asset. Options are a type of derivative that give the owner the right, but not the obligation, to buy or sell an underlying asset or instrument at a specified strike price on or before a specified date. The seller incurs a corresponding obligation to fulfill the transaction, that is to sell or buy, if the long holder elects to “exercise” the option prior to expiration. The buyer pays a premium to the seller for this right. An option that conveys the right to buy something at a specific price is referred to as a call; an option that conveys the right to sell something at a specific price is called a put. The value of an option is commonly deconstructed into two parts. The first of these is the “intrinsic value,” which is defined as the difference between the market value of the underlying asset and the strike price of the given option. The second part depends on a set of other factors which, through a multi-variable, non-linear interrelationship, reflect the discounted expected value of that difference at expiration. Today, many options are created in a standardized form and traded through clearinghouses on regulated options exchanges, while other over-the-counter options are written as bilateral, customized contracts between a single buyer and seller – one or both of which may be a dealer or market-maker. Whether the option holder has the right to buy (a call option) or the right to sell (a put option). The quantity and class of the underlying asset (e.g., 100 shares of XYZ Co. B stock). The strike price, also known as the exercise price, which is the price at which the underlying transaction will occur upon exercise. The expiration date, which is the last date the option can be exercised. The settlement terms – for instance whether the writer must deliver the actual asset on exercise, or may simply tender the equivalent cash amount. The terms by which the option is quoted in the market to convert the quoted price into the actual premium – the total amount paid by the holder to the writer. European option – may only be exercised on expiration. American option – may be exercised on any trading day on or before expiration. Bermudan option – may be exercised only on specified dates on or before expiration. Asian option – the payoff is determined by the average underlying price over some preset time period. Barrier option – any option with the general characteristic that the underlying security ‘s price must pass a certain level or “barrier” before it can be exercised. Binary option – an all-or-nothing option that pays the full amount if the underlying security meets the defined condition on expiration, otherwise it expires worthless. Exotic option – any of a broad category of options that may include complex financial structures. Vanilla option – any option that is not exotic. An estimate of the future volatility of the underlying security’s price over the life of the option. More advanced models can require additional factors, such as an estimate of how volatility changes over time and for various underlying price levels, or the dynamics of stochastic interest rates. In 1973, Fischer Black and Myron Scholes made a major breakthrough by deriving a differential equation that must be satisfied by the price of any derivative dependent on a non-dividend-paying stock. By employing the technique of constructing a risk neutral portfolio that replicates the returns of holding an option, Black and Scholes produced a closed-form solution for a European option’s theoretical price. At the same time, the model generates hedge parameters necessary for effective risk management of option holdings. The application of the model in actual options trading can be clumsy because of the assumptions of continuous (or no) dividend payment, constant volatility, and a constant interest rate. Nevertheless, the Black-Scholes model is still one of the most important methods and foundations for the existing financial market in which the result is within the reasonable range. 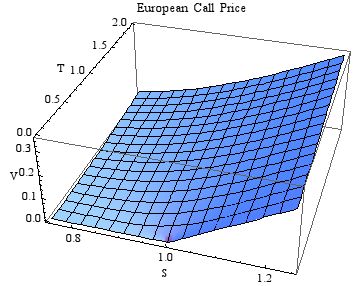 European Call Surface: A European call valued using the Black-Scholes pricing equation for varying asset price S and time-to-expiry T. In this particular example, the strike price is set to unity, the risk-free rate is 0.04 and the volatility is 0.2. The Black–Scholes equation is a partial differential equation that describes the price of the option over time. The key idea behind the equation is that one can perfectly hedge the option by buying and selling the underlying asset in just the right way and consequently “eliminate risk. ” This hedge, in turn, implies that there is only one right price for the option. Valuation of a Call Option: Where: N is the cumulative distribution function of the standard normal distribution; T – t is the time to maturity; S is the spot price of the underlying asset; K is the strike price; r is the risk free rate; and omega is the volatility of returns of the underlying asset. Value of a Put Option: Where: N is the cumulative distribution function of the standard normal distribution; T – t is the time to maturity; S is the spot price of the underlying asset; K is the strike price; r is the risk free rate; and omega is the volatility of returns of the underlying asset.